Airlines can now offer their ultra tech-savvy passengers the chance to board their flight with a mere flick of their wrist and scan of their smartwatch. SITA Lab’s latest innovation in the area of wearable tech is by providing boarding passes for Android watches via its API (application programming interface). 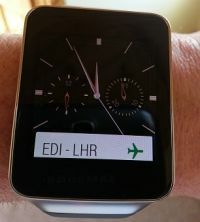 A simple alert via Android Wear technology reminds the passenger of their flight at the appropriate time and location. A quick swipe then reveals the boarding pass and a second swipe displays the barcode allowing the passenger to get through the airport checkpoints and board the plane.